This security poster illustrates the PT Mi-Ba-II Former Czechoslovakia Anti-Tank Mine. This rectangular mine uses two operating fuzes. The mine is constructed from Bakelite and with minimum metal content, and it is deployed extensively in African countries. This security poster features the technical specifications of the PT Mi-Ba-II Czech anti-tank mine, a sectioned PT Mi-Ba-II anti-tank mine, the PT Mi-Ba-II transit case, the lid reversed for transit, and photographs of how the mines may be laid in their transit cases. 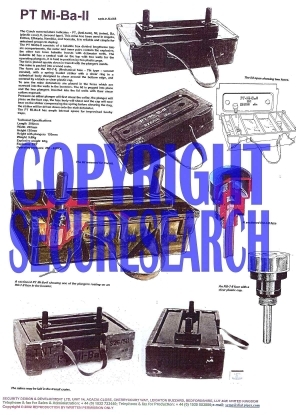 This security poster also shows the lid of the transit case open to show two fuzes, a sectioned RO-7-II fuze, and an RO-7-II fuze with a clear plastic cap. The PT Mi-Ba-II transit case. The lid reversed for transit. Photographs of how the mines may be laid in their transit cases. The lid of the transit case open to show two fuzes. An RO-7-II fuze with a clear plastic cap. The technical specifications of the PT Mi-Ba-II Czech anti-tank mine. This security poster features the technical specifications of the mine, the sectioned mine, the mine's transit case, the lid reversed for transit, the mines laid in their transit cases, the transit case open to show two fuzes, a sectioned RO-7-II fuze, and an RO-7-II fuze with a clear plastic cap.